Stariel Knits | Catching up on reading. Since the cross-country road trip I’ve been shuttling between Salem, OR and Seattle, WA and knitting here and there. Actually I haven’t been doing as much knitting as I expected – and my spinning wheel is still in pieces on the living room floor. Mostly I’ve been reading lots of books. Nothing knitting related. Most of my yarn is packed along with my sock blockers and all my knitting books save Knitting Vintage Socks… and my swift and ballwinder which prevent me winding the two skeins of yarn that have appeared at this address. Whew. I’ve learned I can be a single-WIP girl when I’m forced! 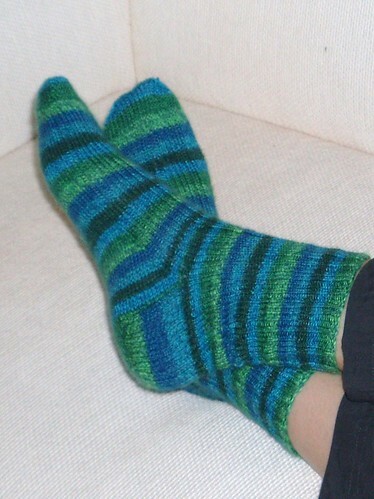 These socks are the twin socks pictured in that entry. MJ and I have a collection of matching yarn with which we plan to make matching socks, and – once she finishes hers – these will be our second pair. Since I was out of accessible projects I grabbed some Yarn Pirate merino tencel and started another pair of socks today. I’m beginning to be very glad that I packed so much “emergency yarn” for the road trip. Very cute – love the colors!